There are good running days and bad running days. Saturday, February 1st was a bad one. From the moment I started, my feet felt like cement hitting the pavement and I just couldn’t wait for the run to be over. I’m not sure why it was so difficult. I did my usual warm-up. I didn’t run a more difficult route than usual. Yet, I felt like my legs were letting me down. I didn’t let the struggle keep me from running the full 12.5 miles, but it was a rough one. As soon as I finished, stretched, and cleaned myself up, I headed to the fridge to grab a beer I knew would put a smile on my face. 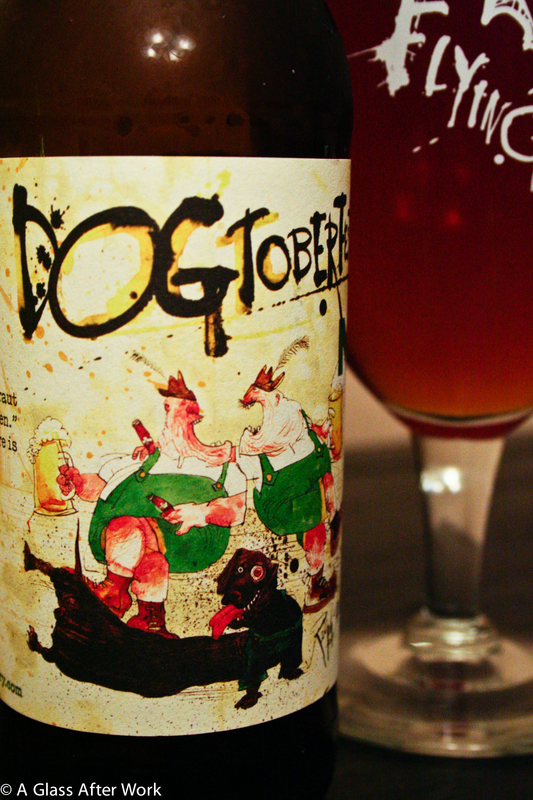 Flying Dog Brewery’s Dogtoberfest Märzen (brewery) is brewed with 100% German ingredients, although it is made in Frederick, Maryland. The beer had a medium reddish-amber color with about an inch of off-white, foamy head. On the nose, there was some nuttiness and maltiness with hints of caramel and black pepper. In the mouth, there was a nice maltiness mixed with lemon zest, biscuits, and caramel. The beer was a medium body with a mild bitterness and good balance. Is this worth a glass after work? Definitely! If you see this beer in the store, grab it; you won’t be disappointed. At $2 a bottle, this Octoberfest beer offered something a little different. After my run, I opened my last two bottles of the season, and I was sad to see them go. The beer is refreshing, with good flavor, and perfect for drinking while trying to relax my sore muscles. 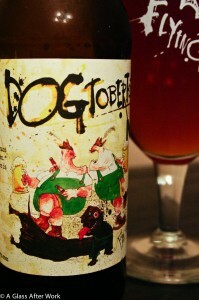 The nice thing about Dogtoberfest is that it’s also very food friendly. It’s the perfect beer to drink while snacking on some cheese and crackers or having a German dinner complete with bratwurst. I think it also might go well with something a little sweeter like teriyaki chicken. Question of the day: Do you drink seasonal beers? If so, do you have a favorite season?